IIT Rankings 2019: The Indian Institutes of Technology (IITs) are the most prestigious and top engineering institutes in the country. The first IIT was set up in Kharagpur in 1951, soon followed by IIT Bombay, IIT Madras, IIT Kanpur and IIT Delhi. As of 2019, there are 23 IITs in India and The total number of Seats for UG Programmes in these 23 IITs are 11279. Every IIT is linked to the others through the IIT Council, which oversees their administration. 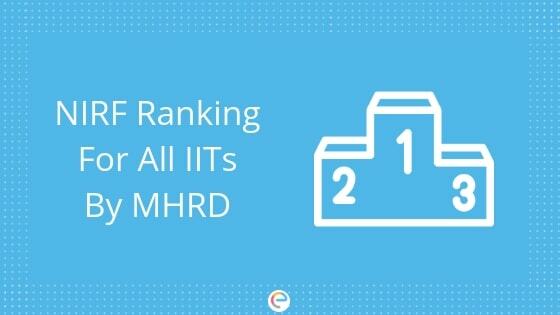 Every year, the Ministry of Human Resource Development (MHRD) releases the latest IIT rankings through the National Institutional Ranking Framework (NIRF). Here, we bring you the list of best IIT colleges in India with their official NIRF IIT rankings 2019. The MHRD releases NIRF ranking for all institutes, including each IIT college, across the country on parameters which broadly cover “Teaching, Learning and Resources,” “Research and Professional Practices,” “Graduation Outcomes,” “Outreach and Inclusivity,” and “Perception. There are a couple of things that a student must understand when viewing these NIRF ranking of IITs by MHRD. The rankings 1-4 interchange very frequently. They are so close to each other in quality that it doesn’t really matter. However, most consider IIT Bombay to have greater brand value. It is also more accessible, hence, the top rankers prefer IIT Bombay over Kharagpur. IIT Guwahati has a high ranking as it has recently won accolades such as world rank 87 for universities under the age of 50 by the Times Higher Education World University Rankings, and is the first Indian university to make this list. However, the rankings from 6-9 are also very very close to each other, and hence the exact order does not matter between IITs ranked 6-9. The IITs are the reason lakhs of students appear for the JEE Main & JEE Advanced every year. Do you have what it takes to get into the top IIT colleges? First, you should know the JEE Main Cutoff and JEE Advanced Cutoff. If your dream is to get into any one of the IIT colleges, you should get cracking with your JEE Main & JEE Advanced preparation because the competition is very stiff. Besides the IITs, there are other engineering colleges that are among the top engineering colleges in the country, like the NITs and BITS Pilani. Find out about other top engineering colleges in India. How can you get into institutes with top IIT Rankings? Getting admission to B.E./ B.Tech. courses in one of the colleges with top IIT rankings in India requires an extensive amount of learning, practising and mock tests. With the proprietary tools at Embibe, we help aspirants reach engineering colleges with top IIT rankings. Embibe provides free JEE study material which contains notes, video lectures, formulas, reactions, equations, important and previous year questions for more than 15,000 concepts that cover the entire syllabus of all the engineering entrance exams. The free JEE practice questions contain innumerable questions selected from the best books for JEE recommended by IITians and top academicians. It also contains previous year questions. The detailed solution of every question is also available that will help you have a better understanding. Embibe also provides free JEE mock tests which are of the same nature as the actual exams. Not just that, Embibe gives detailed feedback of your tests which lets you identify the important areas that you need to improve on so that you score higher. 5. Your attempt effectiveness – questions you got right within the ideal time, questions you took more than the ideal time to answer, your careless mistakes, etc. With this level of insights, you can definitely crack JEE Main & JEE Advanced with a very high score! Apart from these, Embibe’s premium product RANKUP provides personalized guidance that gives step-by-step instructions until you are in a position to get into your dream college – one of the top 100 engineering colleges in India. We also let you compare scores with toppers from each section and how much more do you need to work to secure admission in a college of your choice. We hope this detailed article on the IIT Rankings has helped you. If you have any query related to the IIT Rankings, drop a comment below and we will get back to you at the earliest.